A researcher generates vast amounts of data during his or her career. But what to do with it all? Some data will be condensed into figures or tables in academic papers. Raw data can be included in publications as supplementary files, or deposited in a large range of repositories. Some data will be shared with colleagues in the lab, research institute, or collaborators further afield. But a vast amount of data goes unseen, unused, and uncredited. Now that data can be shared and reused freely, through some new initiatives now running at Elsevier and the Materials Today family of journals. It is a move that Elsevier believes is good for research and innovation, and one where publishers have a key role to play facilitating the storing, sharing, and using of data. “There is a significant move towards being more transparent and sharing data will help with ensuring reproducibility,” explains Dr Baptiste Gault, publisher for materials science at Elsevier. “Publishers have to make it easy for researchers to share data,” he says. “Data is an integral part of research and needs to be an integral part of communication and publishing.” Dr Hylke Koers, head of content innovation at Elsevier. Elsevier now has a number of routes available for researchers wanting to share data while retaining authorship and receiving credit for its reuse. From February this year, researchers publishing work in one of 16 (and growing) selected journals in materials science can, if appropriate, choose to share whole data sets alongside their article using Open Data , turn data in the article itself into interactive graphs via Interactive Plots (iPlots) , or submit a complementary ‘microarticle’ that describes the data associated with the article to the open access journal Data in Brief , which can house the data set or link to another curated online repository. Researchers publishing in one of sixteen top Elsevier materials science journals, including Acta Biomaterialia, Acta Materialia, Scripta Materialia, and Polymer, can make supplementary data available publicly to nonsubscribers using Open Data. But this isn’t limited to the Materials Today family, and a further 30+ titles across Elsevier’s journal portfolio are now linked directly to Data in Brief, allowing contributors to submit datasets alongside regular journal articles at the click of a button. Without having to make an additional submission, a brief description of the data following a standard template simply has to be uploaded. 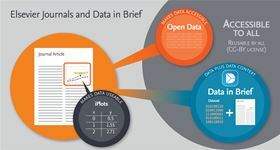 Data in Brief can now also publish standalone datasets and data articles not associated with an article. The advantages for researchers are many-fold. Data is now easier find, reuse, and cite, facilitating the reproducibility of results and new studies, while the originator of the work gets the credit via a citation using the widely recognized Creative Commons ‘CC BY’ license. Putting the spotlight on ‘big data’ is another new journal, Materials Discovery , which is bringing together materials science and informatics. High-throughput methods are the bread-and-butter of drug discovery and biomedical research, but is now increasingly common in materials discovery and characterization as well. Gault says the response from the research community in these early stages has been positive. “Within the first two weeks, we’ve seen uptake by authors and I am sure that more will embark on [data sharing] in the future,” he adds. Click here to read how Materials Today supports the Materials Genome Inititative.